Have you always wanted to build a golf putting green at your Seattle home to practice your short game at any time or the day or night? Tired of going to the golf course to work on your putting only to be distracted by other golfers? Our beautiful and revolutionary synthetic turf blend allows us to custom build a stunning backyard while cutting out the yard work associated with a regular grass lawn. We can help design your ideal practice golf green in your Seattle home today! 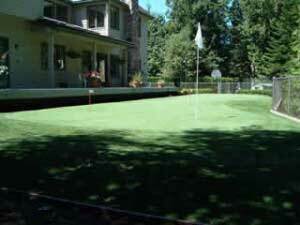 Artificial golf greens from SWG Seattle can be installed in your residential or commercial outdoor area. 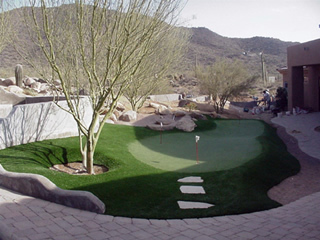 Build a golf putting green for your backyard and come home to practice on your personal synthetic golf greens at any time. We can also construct and install synthetic putting green areas for commercial applications. Building an artificial golf green for your home has never been easier with Southwest Greens Seattle’s state-of-the-art techniques. The installation process results in a stunning lawn that does not look or feel fake! 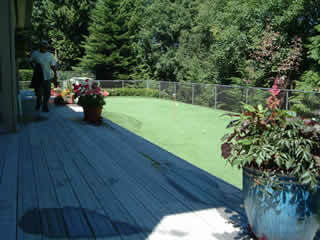 Leave all of the aspects of your backyard golf putting green to the professionals at Southwest Greens Seattle. Our artificial grass is low-maintenance, always green and easy to maintain. Build your personal putting green with the company countless golf pros have entrusted the construction of their own putting greens with. Contact us for a free green consultation today.